There are certain things you’d want to get from a good winter boot. Among others, probably the most important features are for it to be tough, waterproof and comfortable. Adidas once again gives us a perfect winter boot for the outdoors that meets all those conditions – Outdoor Terrex Ultimate Boost CH Winter Boot. This boot is fully waterproof. It’s made for harsh weather and will provide an energy boost for any outdoor activity, especially fast-paced hiking and snowshoeing. Adidas Boost technology provides temperature resistance from -4 to 104 degrees Fahrenheit and delivers great cushioning properties both in the heat and in the cold, even after you’ve walked for hours. It will ensure you stay as comfortable as when you first got into the boots. 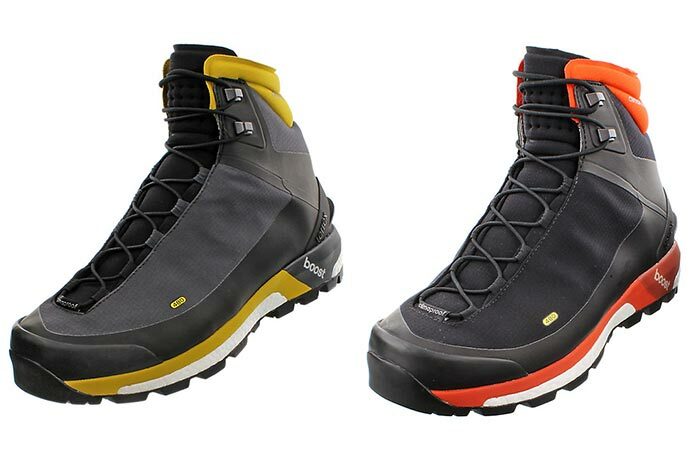 Different color combinations of Adidas Outdoor Terrex Ultimate Boost CH Winter Boot. As for insulation, Primaloft keeps your feet warm and dry while at the same time being lightweight and breathable. Climaproof membrane is also incorporated into this boot, and what it does is it allows the heat and perspiration to evaporate, while keeping your feet dry the entire time. It works together with Climaheat to regulate the body’s temperature. Just like in most Adidas boots, Continental rubber outsole is found here as well. It delivers optimal traction, especially for wet conditions. The upper boot is made from textile and synthetic and the padded collar and tongue will keep the cold and snow out. The boot is mostly dark grey and black, but has a nice colored detailing you can get in a few combinations.